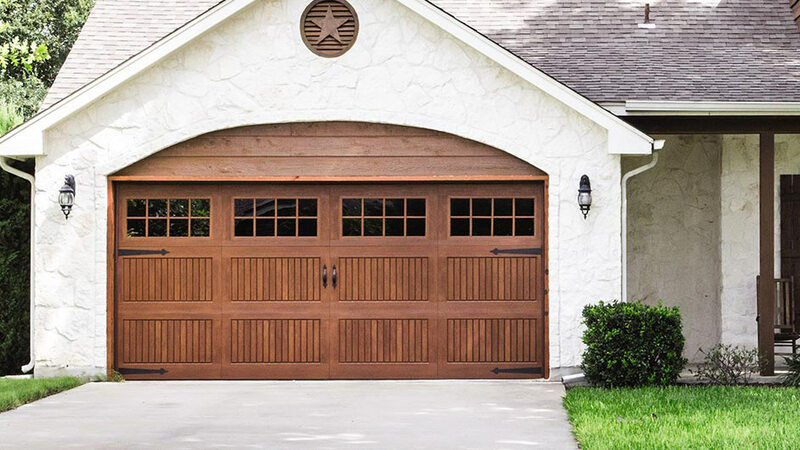 When looking for the warm look of wood for your garage door, but without the potential warping, cracking, or rotting, consider a Wayne Dalton fiberglass garage door. While the surface of the doors has the appearance of a wood grain, durable steel construction is found underneath. 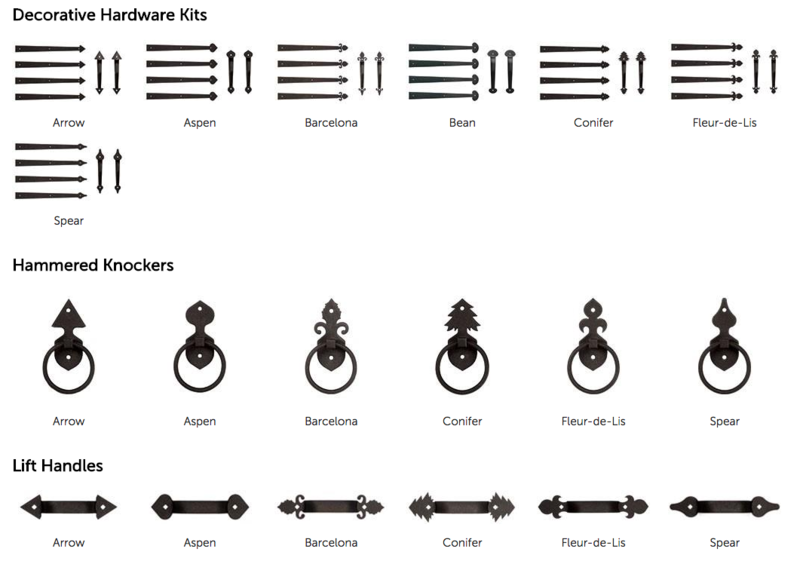 There are several combinations of styles, colors, and hardware to make your garage door blend in with your home or to add a touch of uniqueness. Fiberglass doors feature a TorqueMaster Counterbalance system that improves safety and include an anti-drop device. All doors have a bottom weather seal that keeps bad weather out as well as improved insulation in every door. 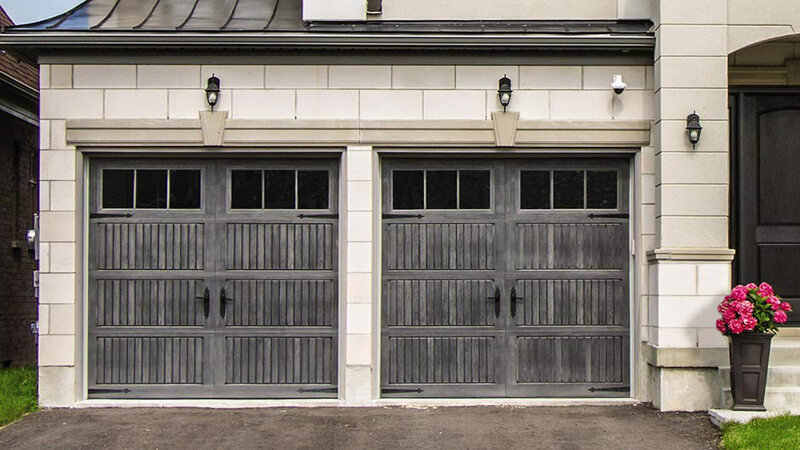 When choosing a fiberglass garage door, the physical size of the door needs to be considered. Garage doors that are seven feet high will feature three-section doors and garage doors that are eight feet high will have four-section doors. Both sizes have the same patterns: horizontal raised, vertical raised, Sonoma and V-Groove. An oak grain pattern is used on the raised panels. 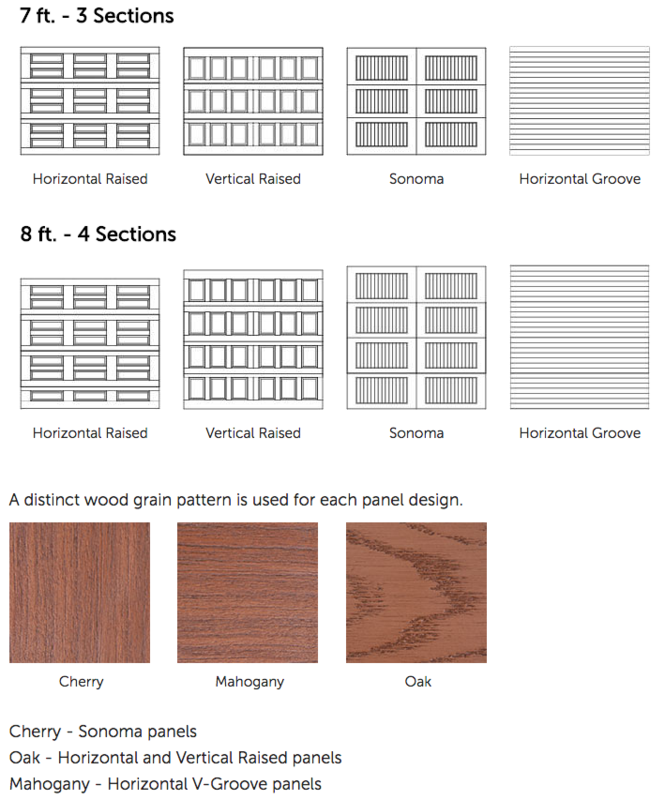 For the sonoma panel, a cherry grain pattern is used and the v-groove has a mahogany grain pattern. Once the size and the grain patterns are decided on, it’s time to choose a stained finish for the door. Darker colors, such as mahogany, walnut, cherry, green and red oak offer a stately look while lighter colors present a crisp appearance and come in white, clay, and gray. Honduran mahogany and oak can go either way depending on the accent colors of the door. Adding a touch of interest – as well as allowing more light into the garage – windows are available for each door panel design. Windows come in clear, satin etched, and obscure and an optional insulated glass will improve thermal performance on horizontal and vertical raised panels. 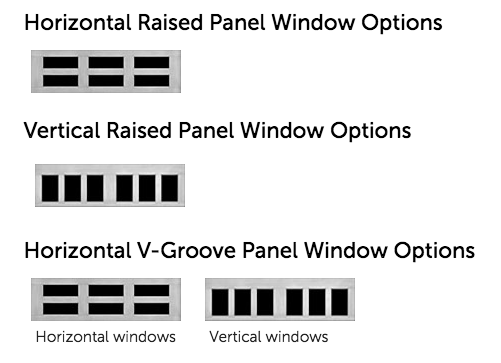 Horizontal and vertical raised panels each have one window option, V-groove panels have two window options and Sonoma panels feature six window styles. While many garage door windows are placed near the top of the garage door, there are options as well. Windows may be arranged vertically as well as horizontally and can make up 50 percent of the door itself. *V-Groove window configurations above is based on a 9’ wide door. 8’ wide doors feature a different window configuration. See dealer for details. Windows may be arranged vertically or horizontally. Up to 50% of the door can include windows. Windows placed in the bottom section of a door must use DSB 1/8”, or tempered, or insulated glass. Vertical window options can be placed as a special order. For the final bits of flair for the garage door, black powder coated steel hardware will be added. The Euro Collection, the America Collection, and six different styles of hammered knockers will complete the look of the fiberglass door. 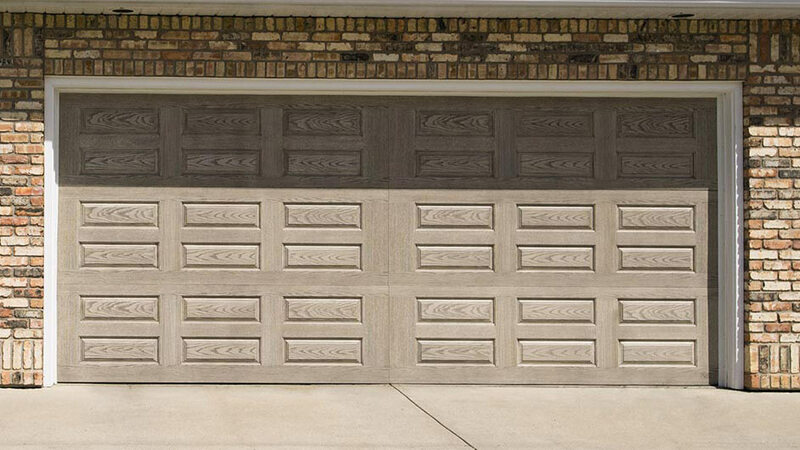 If you are thinking about replacing your garage door, contact us today for more information about fiberglass doors. With a wide range of panel options, colors, and window placement, Performance Building Products can find the perfect garage door for your home.